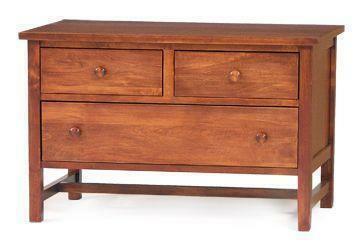 Our Amish Modern Shaker Low Chest of Drawers is handcrafted from solid wormy maple wood or hard maple wood. Please call us to receive finish samples for this Shaker Dresser. This Shaker Chest of Drawers is perfect for a guest bedroom, kids room or even as an oversized night stand. It comes standard with Solid Hardwood Construction, Dovetail Drawers, Solid Wood Drawer Slides and Dust Covers Between Drawers. Upgrade to our full extension drawer slides or the popular soft closing drawer slides. Please allow four to twelve weeks for this chest of drawers to be built. This is custom made for each customer which is why it can take time. You can't rush quality!